Royal Isabella is all grown up with La Casa and 20 Casitas and more to come! Royal Isabela, Heaven on Earth with more to come. I first saw her as a baby toddler back in 2011. Now she is all grown up, a young beautiful woman, with a magnificent future in front of her. Royal Isabela is no different than the highly acclaimed graduate at a commencement exercise. You can see the doctor, the engineer, the lover of life within a vibrant, young and engaging entity of destiny. Three years ago when I visited Royal Isabela she was the location, the golf course and the visionary people building the finest golfing destination of the Caribbean Cosmos. Today our Isabela has gone well beyond where she was then. Royal Isabela is now a ‘home,’ a place to be one with yourself, your mate and nature. There are 20 casitas ready to host you. 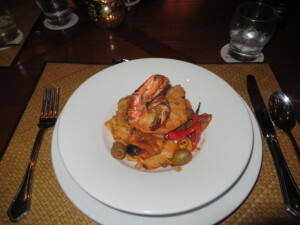 There is fine dining at La Casa as delectable to the appetite as the setting and views are to the golfing experience. With the spirit of the native Taino present on the land and sea and within you once there, she is Heaven on Earth. Yet she is only beginning, there is more to come, even more intimacy to come than I found on these first two visits. There is more there, past, present and future, than even I could fathom during my two cherished visits. Let me reminisce with you and take you back with me to Royal Isabela to experience all her delights and promises. The Taino Indian face carved in the rock wall makes the turn to Royal Isabela. You are getting close and can feel her presence. Whether you fly commercial into San Juan or a private jet into nearby Aguadilla there is a point where you turn the corner on Route 2 and the most beautiful part of all the 300 miles of Puerto Rican coastline lies before you. 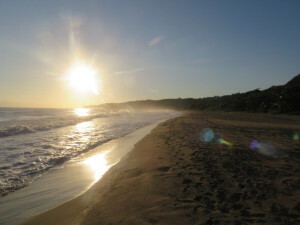 Where the beautiful blue waters of the Atlantic Ocean transition south to the Caribbean Sea, Isabela sits royally on the cliffs high above the surging waters. She knows her destiny is to welcome guests and share her heritage, peacefulness and beauty with them in a meaningful way. A century ago you could have arrived to this area via the national railroad through the Guajataca Tunnel. 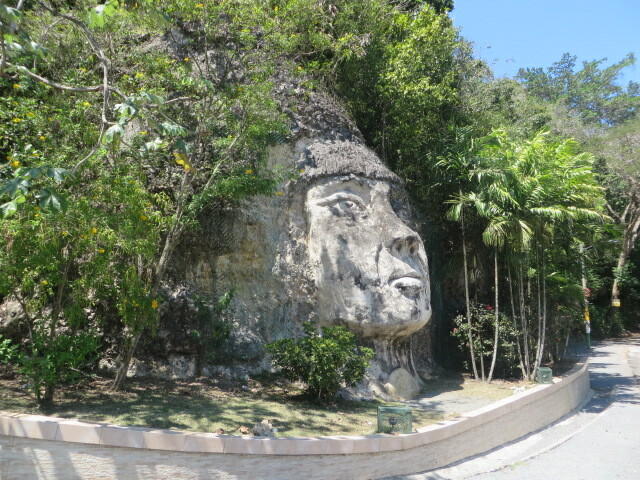 Today, take a right at the Taino Indian face carved in the rock wall. Welcome to Royal Isabela! 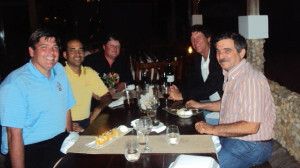 Like any other ultra highly acclaimed resort it is the people that make the difference at Royal Isabela. The people behind the scenes with the vision and the people one meets face-to-face in the course of a luxury vacation. Good to see Stanley again and catch up on Royal Isabela’s last three years and her future plans! For me, and likely for you when you visit, lucky are we who get to meet both. This isn’t going to come out sounding right, but like the golf course, owner Stanley Pasarell, General Manager Joaquin ‘Tito’ Lopez, Director of Golf Miguel Suarez and Golf Course Superintendent Dean Vande Hei have all gotten better with time! It was good to be with old friends. Stanley looks fantastic and is beaming as any loving parent would be as Isabela continues to grow and mature. 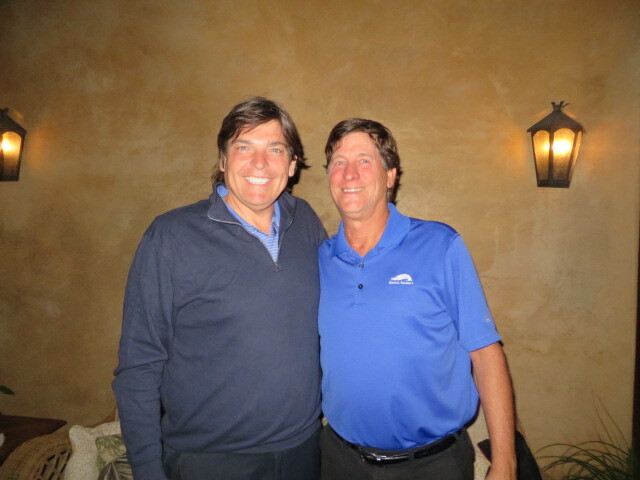 Tito, the man behind the scenes is managing better than ever as is evident with your visit to Royal Isabela. All one needs to say about Miguel is that this was the 7th Puerto Rico Open edition of the PGA TOUR on the Enchanted Island and this young man has competed in all seven. With regard to Dean, all one needs to see and play is the golf course in her Open links style condition and you will feel his loving contribution to Royal Isabela. CLICK here for a VIDEO INTERVIEW with Stanley Pasarell and Dean Vande Hei. CLICK here for a VIDEO INTERVIEW with Miguel Suarez. 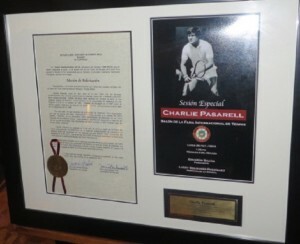 Stanley’s brother charlie was inducted into the International Tennis Hall of Fame in 2013. I have yet to meet him but feel I know him through Stanley and Royal Isabela. Can you tell I love these guys and this place? This return trip, staying in the new casitas, upon reflection, was like the difference of visiting friends for dinner and an evening together versus being an exchange student and staying with a family for a few months. Casita No. 15 was my home for a few nights embedded in the golf links and a few steps from fine dining at the Restaurant at La Casa and the wet and wild beach below. Let’s focus on the accommodations, restaurant and golf for now. My interesting and seductive descent to the beach early my last morning there will be the subject of another story. Plunge pool with an ocean view in each casita! The casitas are immaculate, perfectly designed and incredibly comfortable. And the view of the Atlantic Ocean from every one is breathtaking. Whether it is opulent functionality or functional opulence it is a sensational experience to reside in the casita neighborhood at ‘Heaven on Earth.’ There is a circular course within each casita- from a bed so comfortable that it must be what it is like for an angel to sleep on a cloud, to the high tech living area, out to the deck with an inviting lounge chair for an afternoon nap, to being immersed in the refreshing private plunge pool, to returning inside via the shower room and through the lavish bathroom back to the open bed space. 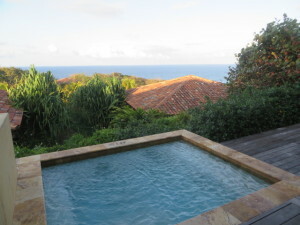 Second time around there is the door to the swimming pool, lap pool, beach, tennis court, golf course or La Casa. One of the finer, if not the finest, place I have ever stayed and I have stayed in quite a few! Three years ago there was only golf and not a bed or plate on the property. Actually that is not true as I stayed with Stanley on my first visit in an existing house that was retrofitted into an office and lodge by the front gate. 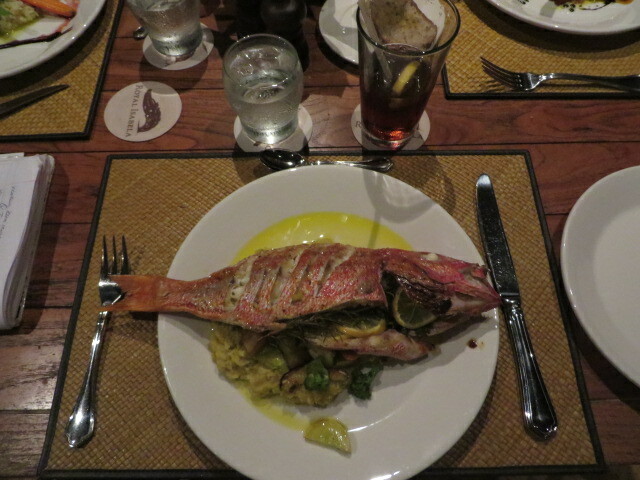 I also ate at The Grill at the Pro Shop with a beautiful view of the golf course. I still remember sitting there three years ago after playing the first nine eating a tasty panini. 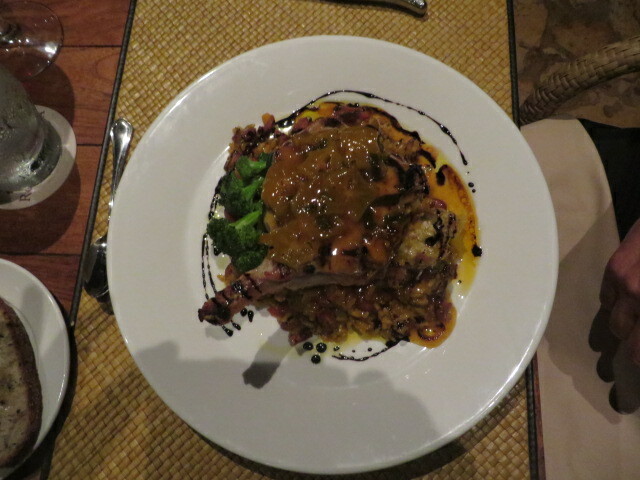 But let me tell you that the culinary delights at Royal Isabela rival the casita and golfing experience. It is true that the chef goes out to their farm and garden each morning to see what is ready to harvest. They do cook real food with real heat just in time for your watering mouth to be satisfied. With Pastry Chef Katiria Nieves Diaz and Chef Jose Carles Fabregao. 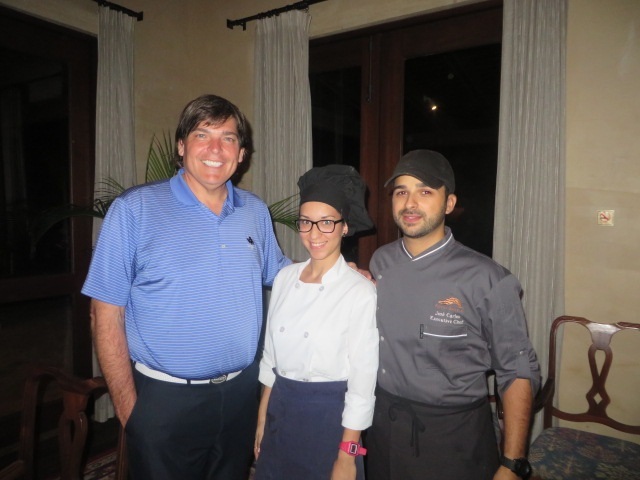 There food satisfies my hunger and is part of Royal Isabela’s fascination and inspiration! While playing golf with Stanley he took care to point our the tropical fruit trees in the 5th fairway that bear heart-shaped Corazon. 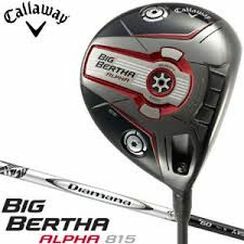 He spoke of their unique taste and evidently picked a few and snuck them into his golf bag sort of like my Dad up at Ely Park. Growing up there was always something in season to be picked- raspberries, apples, mushrooms, you name it! 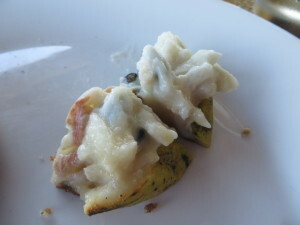 The next morning the ultimate host surprised me with Corazon hearts prepared for me to taste! They were exquisite with a mango-pineapple-pear taste and texture. 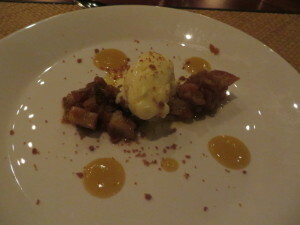 At the end of the article I have attached a six pictures of the savory and succulent dishes prepared by Chef Jose Carles Fabregao and Pastry Chef Katiria Nieves Diaz. 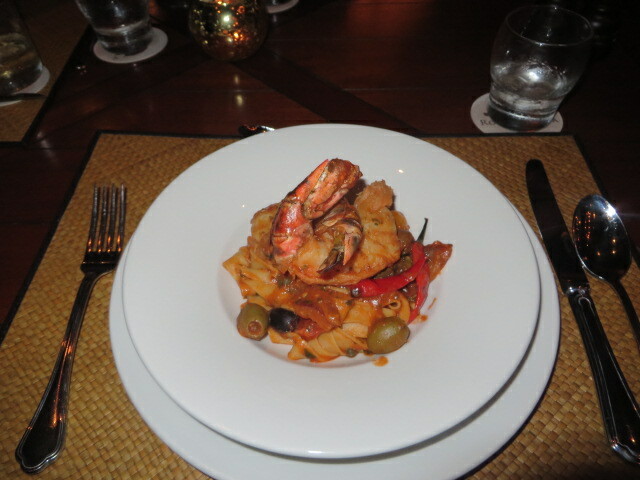 But of course, like sleeping in the bed in the casita, plunging into your own private pool, playing the golf links and absorbing the intimate comfort of Isabela, you will want to taste these and other dishes for yourself. 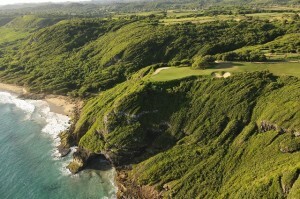 Aerial view of 17th green. Photo Credit: Royal Isabela (I can’t get as high as John Denver!). Last, and of course first, in my mind- the golf, the golf, the golf! When Hollywood makes the Royal Isabela movie entitled ‘Heaven on Earth’ I want to play the part of Hervé Villechaize but instead of calling me ‘Tattoo,’ call me ‘Golf Redo Anytime Andy.’ The Tee, The Tee, The Tee! Seriously it is a vision of mine! What can I say but what I said when I first saw, played and experienced the Golf Links at Royal Isabela? 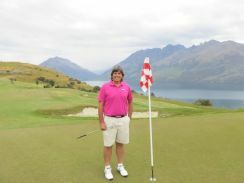 I only infrequently use comparisons to other golf courses and always like to go beyond the words ‘awesome, spectacular and incredible’ with more details and texture to my experiences. But you may have experienced two golf courses either in person or while intimately watching others play them on television or seen them in golf picture books. The Golf Links at Royal Isabela, in my opinion, are similar to a combination of Pebble Beach Golf Links and the Old Course at St. Andrews. There I have said it without regret or offense to anyone because it is true. 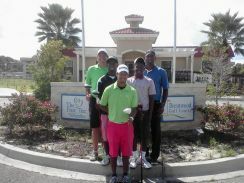 CLICK here for a VIDEO INTERVIEW & Tour of the Golf Links with Stanley Pasarell. Did I mention the sunsets on the links were spectacular and romantic for an evening walk upon arrival? The land, the cliffs, the proximity of and the view of the ocean is similar and even more natural and undeveloped than Pebble Beach. The golf course design, especially on the second nine, albeit only six years old, rival the grounds at St. Andrews. After all haven’t both been in existence the same length of time? 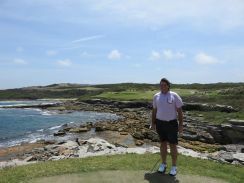 Stand on the fairway of the 5th hole near those Corazon heart trees and laid out below you is a V-shaped gorge that centers the beauty of the Atlantic ocean like a vase overflowing with pure blue joy. Take a moment to do a full 360 at the point by the double 12th & 14th green as slow as you can opening each eye as wide as you can. And then do it again with your eyes closed and feel the ocean breeze gentle on your face. Have one day at Royal Isabela of golf, dinner and remember those sights and feelings before you close your eyes in the comfortable bed of a casita and I guarantee you your life will never feel the same. My apology as I went off a little bit there but I was back at Royal Isabela in my mind as I am writing this. Golf is interchangeable with life for me. Not the sport (and it is a sport) but the inward searching expanse that golf offers to anyone who is open minded enough to view the game as I do. The name of this website should really be ‘Andy’s Golf, Life & Travel Diary.’ Hopefully the subtitle “Inspired by Golf & Life and Sharing My Experiences & Insight” will suffice for the limited digits of the title. I digress no further at this point on my idiotic, I mean idyllic, life. 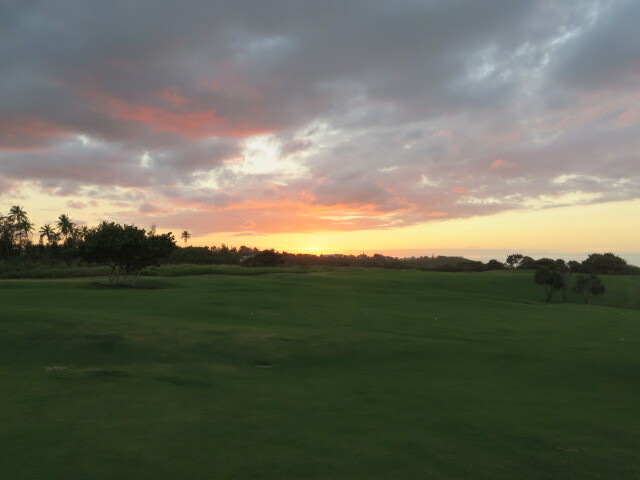 Sunrise along the future golf holes on the beach at Royal Isabela. Royal Isabela is old enough now to have a past, present and future. As far as golf goes you can see her future through that same V-shaped gorge that we see the ocean through on the 5th hole. One day the links and the golfer will continue down that gorge and play three seaside holes, Nos. 6,7 & 8 before reemerging to finish the first nine on the Stanley-Charlie, you choose which green to play, par-5 hole (which is now No. 6) that brings you back to the clubhouse area. The second nine, all links and ocean side on the cliffs, remain the same and the current Nos. 7, 8 & 9 become warm up holes which in of itself is a master design gem by golf course architect David Plaff and brothers Stanley and Charlie. Those three holes- a memorable dog-leg-right par-4, a strong straightaway par-5 with a green tucked right and protected by water and the island green par-3- are themselves a golf course in miniature. David, Stanley and Charlie didn’t take credit for the complete design. On the scorecard Mother Nature herself is credited. What a design foursome! 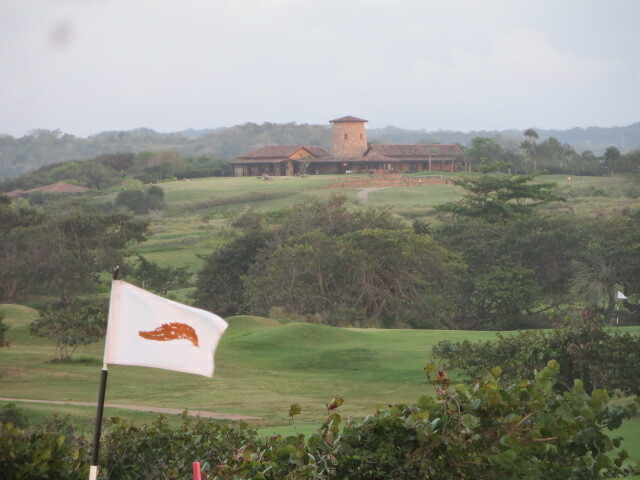 CLICK here for a BEAUTY VIDEO of Royal Isabela- the Golf Links, La Casa & View from Casita No. 15. As far as the future at Royal Isabela, the culinary creations at the Restaurant at La Casa are as unlimited as what the ground can grow. If you are looking for a beautiful place to call home there are 29 homesites embedded amidst the links with a mind sure to preserve the views and sensitive intimacy of Royal Isabela. In that case La Casa truly becomes your home. Like the migratory ‘Atlantea Tulita’ butterfly that disappears and then reappears at Royal Isabela I hope one day to make my way back to her loving arms. There is no doubt in my mind that she will have blossomed even further. Once onsite and in her enveloping presence she will take me some place new, within and outside myself. I think that is Isabela’s promise. There will be renewal, awakening and inspiration in each guest on every visit. It has now happened to me twice! CLICK here to see my 2011 article on my first visit to Royal Isabela. Carazon heart fruit was tasty, Note bite taken before picture! Two massive shrimp like these make a meal! One wonders about the origin of the nickname. There are big shrimp too! Cordillera Coffee-Crusted Rib Eye, Served with Yucca and Plantain Gratin and Sautéed Organic Chard. Local Snapper with La Casa Grove Citrus Sauce, Accompanied by River Farm Chayote Slaw and Warm Gatehouse Garden Heirloom Tomato Salad. Puerto Rican Farm-Raised Rack of Lamb with Acerola Mint Sauce, Served with a Tomato, Eggplant and Zucchini Tart. For dessert Apple a la Royal Isabela mode!